Quincy’s is a small, local chain with an outpost in the cafeteria where I work. I’ve eaten there about a half-dozen times when I’ve had a burger craving but haven’t had time to leave the office. 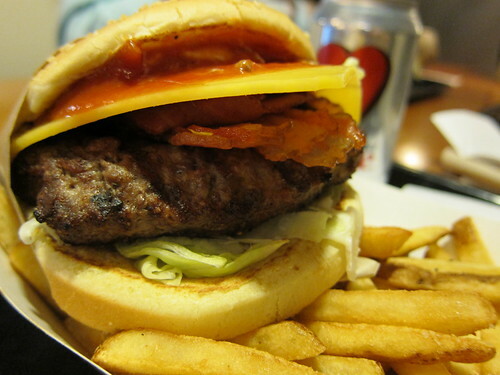 Today’s specimen was a “Quincy Burger” with bacon and cheddar cheese, minus pickles. The burger was clearly a preformed patty without much texture or flavor. The cheese not only wasn’t melted, it wasn’t even warm. The bacon was limp. The burger was drowning in mayo and ketchup – I had to wipe a lot of it off with a napkin to eat it. The lettuce was the cheap shredded stuff. The tomato was actually ok. While the bun showed slight toasting marks, it’s didn’t taste toasted or above room temperature. The fries were generic, frozen-before-cooking fries. + it’s close to my office. Wow, the cheese is not even melted. That is pretty sad. Are you sure it was cooked fresh? Was it even hot or luke warm? 2 stars seems generous. The cheese looks a little scary! Seriously, i hate that they even attempt to melt the cheese. And the buns are terrible. 2 stars has to be purely on location. God Dammmit! And The picture even made me feel hungry, could this burger be any worse? Wow, even the picture you took makes the burger look unhappy. I didn’t even get hungry after taking a look at this one. My condolences man. I’m always disappointed when restaurants use pre-formed patties. Reminds me of a burger I had at an otherwise decent gourmet restaurant here in Brooklyn. Everything else I’ve ever had there was top notch…then the burger comes out. Clearly a mass produced pre-frozen patty, lukewarm at that. So sad. You work in a cafeteria? What happened to the Microsoft gig? My husband eats there when he heads to the commons and likes the huge one they have … it’s always come out looking better than the picture above … maybe they had an off day or a new cook. Surprised you ate it! You should ask for your money back! And two stars is generous; is that due to location? It sounds like everything about this burger sucked, how bad would it have to be to get 1 star? I also have this same outpost near the building where I work. I tried it once and threw out the burger after having 3 bites. It was without question the worst burger experience I’ve had in the pacific northwest. I even spent extra for Wyagu. It was so bad I emailed Dining Services requesting a real burger option.